It is not uncommon to watch to the news and see a story about a car crash that was the result of a person driving the wrong way down an Interstate, or about a multiple-car pileup that stemmed from someone entering the freeway the wrong way. When you see these stories, you may wonder to yourself, how does that even happen? You are not alone, yet wrong way accidents are a fairly common occurrence, with the U.S. Federal Highway Administration estimating that between 300 to 400 individuals lose their lives to wrong way driving accident each year. While that number represents just one percent of all car accident fatalities in the U.S. in each, the fatality rate compared with the occurrence rate is disproportionately high compared to other types of vehicle-related crashes, at between 12 and 27 percent. Wrong way driving crashes usually involve a high-speed head-on impact that often results in devastating injuries or fatality. Survivors of WWD collisions typically must deal with long-term residual problems that can affect their entire life. Survivors often must undergo extensive therapy, ongoing rehabilitation, and numerous surgeries in order to even achieve a semblance of normalcy. Not only are these treatments expensive, but they can interfere with one’s ability to hold a job, enjoy extracurricular, or live a normal life. If you or a loved one was involved in and survived a wrong way driving accident caused by another negligent driver, reach out to the Miami car accident attorneys at Spencer Morgan Law for a free consultation. With the right team on your side, you may be able to obtain the compensation you need to cover medical expenses, compensate for lost income, and offset the negative impact your injuries have had on your life. Why Do Wrong Way Driving Accidents Occur? Wrong way accidents can occur for a number of reasons, but there are some factors that can increase the likelihood of a WWD. 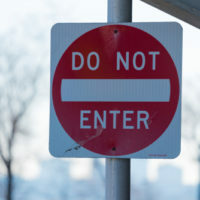 Those factors can be broken up into two categories: Signage and Driver Error. Lack of in-lane arrows, which are used to prevent a wrong way maneuver. Driving with a known mental condition. Because most WWD accidents tend to occur between midnight and 3:00 AM, it is speculated that drugs and alcohol is the leading cause of wrong way driving collisions. Additionally, findings presented by the National Transpiration Safety Board show that individuals over the age of 70 are overrepresented in being at fault for many wrong way accidents. Poor vision is believed to be the reason for this. In some WWD accidents, proving liability is cut and dry: one person drove the wrong way despite clearly market signs and a non-confusing entrance ramp, or they crossed the median, and collided with an oncoming driver who did not do anything wrong except be in the wrong place at the wrong time. Then there are instances when liability is not so clear. For instances, if there were no signs indicating that a street was one way, or if an already confusing on-ramp was marked by signs there were hidden by bushes, fault could lie with the local or state government. No matter the situation, however, the fact remains that you were severely injured by a wrong way driver and you deserve to be compensated. The Miami car accident attorneys at Spencer Morgan Law are dedicated to helping accident victims recover compensation for damages caused by negligent drivers. If you were involved in a wrong way driving accident that left you with a crippling and life-altering injury, do not wait, and contact our office today.